After 3 days & countless hours, I can finally see the floor of my basement and walk anywhere I want (which wasn't the case a day ago). All toys are sorted, all bins are tucked, and I'm just plain tuckered out! 2 massive garbage cans are filled with recyclables for next week's recycling pick up, and many, many bags & boxes ready to be carted in the big car to take to Goodwill. Through this whole "larger than life" decluttering process, it has all had me thinking A LOT about Annie Leonard's "Story of Stuff." It's also had me thinking of all the plastic pieces I"m getting rid of, the plastic trash floating in the ocean that the Plastiki sailed by in the Great Pacific Garbage Patch, and the oil swirling aimlessly in the Gulf that was so important to drill in order to create these things I'm now getting rid of). Fitting too that on my bedside table, my book marker is in the middle of the chapter "Consumption" in Annie Leonard's "Story of Stuff" book. Just as she'll say, it's the OVERconsumption that does us all in. And I'm feeling it! In an effort to organize, I had my 2 cherubs pull all the toys in the house down to the playroom basement where the sort & conquer process could begin. We're pretty modest with the purchase of our "stuff," but between birthday parties, generous grandparents & other relatives, "Happy Meal" trinkets, and the hand-me-downs of friends and family, we've got a ton of stuff! You notice it when you have heaps of it collected and dumped in one whole place. I'm talking "death trap" here! In part, I did this to show the kids how crazy & out of control all of this "stuff" is--a mini landfill in our own home. As much as the kids were in awe of how much they had, I was one one with the "Ah Ha Moment." I was struck with the "magic of advertising." It's eye-opening for our times when my four year old told me that of course he could offload certain toys to "kids who needed them" (aka: my Goodwill basket), because he "could always go buy another one." Ei yie yie, I shake my head! Yes, I immediately downshifted into "Soapbox #323: Money Doesn't Grow On Trees" & we don't just get rid of things to buy more...but he's four; he's seen commercials; and the advertising industry knows what they're doing! I've got my work cut out for me! It's hard to find the magic bullet that moves children away from that feeling of having spending money burning a hole in their pocket. I know that parents throughout the ages have faced this one...and it's one of the many things out there that makes parenting hard! And it's not "one stop shopping"...it takes countless messages that shopping and stuff does not equal happiness. Not to mention a heck of a lot of fortitude to keep heralding that message. So, armed with fortitude, organized bins, and "the rules of cleaning the basement" (as written and posted by my daughter), we're feeling a little less claustrophobic around...at least till this time next year. 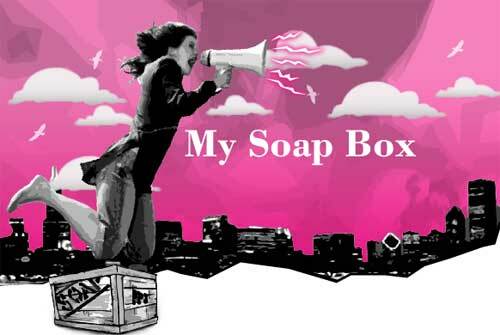 I'm also keeping "Soapbox #323" dusted off and handy to be frequently used!! For those of you wanting to take it a step further, especially if you want to see a faith-based extension, go to http://storyofstuff.org/curricula.php for a Christian-based program for teens on all this "stuff."